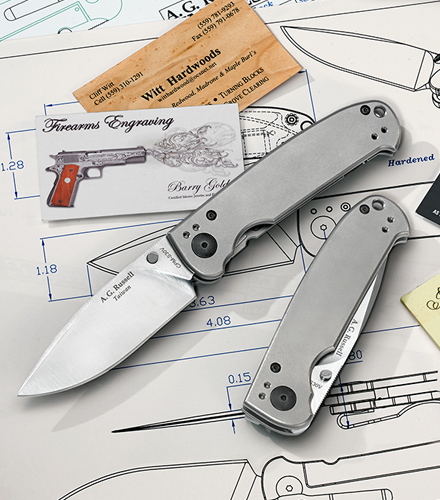 Welcome to A.G. Russell Knives! My name is A.G. Russell III, and I founded this company over 50 years ago. My wife Goldie is the president of this company, and together the both of us are deeply involved in the knife community in the U.S.A.
Our goal is to provide you with quality knives for a reasonable price. And I mean quality. All our knives are inspected right here at our headquarters in Rogers, Arkansas. Our brands are A.G. Russell, Cattaraugus, A.G. Russell Shopmade Morseth, as well as our newest brand, the War Eagle Blades. Our promise to you is satisfaction guaranteed. If you aren’t satisfied, send it back. We will replace it, exchange it, or, if necessary, refund it. We’ll be honest with you, and we appreciate customers who are honest with us. Click on Knives to start browsing our large selection of knives. “Boker Arbolito Stag Bowie. I liked the unique "serpentine" design of the bowie knife blade and I'm a big fan of almost anything with a stag handle. You don't make a big enough deal about the fantastic sheath that comes with this knife, it's actually a huge selling point all on it's own. Site Designed and Hosted by WhyteSpyder, Inc. Please complete the following form to request a catalog and/or sign up for our weekly email for yourself or a friend. We will NEVER rent, sell, or exchange your address outside of our company.